DIE Martis, videlicet, 9 die Augusti. Captains Slingsby and Wake's Cause. Petition of St. Alban's for the Militia to be put in Execution, and for raising Voluntiers. Message from the H. C. for the Lords to concur in the following Instructions and Order. Order for Five Thousand Pounds to Sir G. Chudleigh, out of the Devonshire Proposition-money. Answer from thence, about the Lord Mayor. H. C. Reply to his Defence. Carta H. VII dat. 23 Julii, Anno 20° Regni sui. Message from the H. C. with a Letter from Somersetshire. Message from H. C. with a Letter from Cornwall, and some Votes upon it. Judgement in the Lord Mayor's Cause. Letter from the Committee in Cornwall. Instructions for the Deputy Lieutenants of Nottingham. Ashe's Letter, about some Proceedings in Somersetshire. Ordered, That this House will hear the Cause against Captain Slyngsby and Captain Wake this Day Sevennight; and that the Speaker do write to the Earl of Warwicke, to send up the Witnesses, that they may be heard viva voce. Ordered, That the Lord Lieutenant of the County of Hertford shall presently put the Militia into Execution; and that they shall have an Order for their Indemnity, as they desire. "It is this Day Ordered, by the Lords and Commons in Parliament assembled, That Wm. Bartlett and Edward Anthony, appointed Receivers of the Money that comes in upon the Propositions for bringing of Horse, Money, and Plate, in the County of Devon, do forthwith pay unto Sir Geo. Chudleigh Five Thousand Pounds, upon Accompt, out of the said Monies." That this House agrees with the House of Commons in these Instructions, and the Order now brought up. That the House of Commons will presently send a Committee, to manage the Evidence against the Lord Mayor. The Committee of the House of Commons being come, the Lord Mayor was brought by the Gentleman Usher, as a Delinquent. And Mr. Serjeant Wylde proceeded to the Reply. But Mr. Heron, Counsel with the Lord Mayor, desired, "That the Words in the Charter might be read, which was offered the last Day, Folio 57, to this Purpose, That the Mayor and Aldermen, with the Consent of the Commonalty, may vote." Mr. Serjeant Wylde said, "That whereas it was insisted upon, that the Charge is too general and uncertain; this House, being the Great Court, is not bound to the Formality of other Courts. "That the Lord Mayor ought to take Notice of the Law in all Cases. Proclamations cannot alter the Law. "Concessimus insuper, pro Nobis & Hæredibus Nostris, & hac Carta Nostra confirmavimus, Majori et Aldermannis Civitatis prædictæ, quod, si aliquæ Consuetudines, in dicta Civitate hactenus obtentæ et usitatæ, in aliqua Parte difficiles seu defectivæ existant; aut aliqua in eadem Civitate de novo emergentia, ubi Remedium prius non extitit ordinatum, Emendatione indigeant; iidem Major et Aldermanni, ac eorum Hæredes et Successores, de Assensu Communitatis ejusdem Civitatis, Remedium congruum bonæ Fidei et Rationi consonum, pro communi Utilitate Civium dictæ Civitatis et aliorum Fidelium Nostrorum ad easdem confluentium, apponere possint et ordinare, quoties et quando eis videbitur expedire; dum tamen Ordinatio hujusmodi Nobis et Populo Nostro utilis ac bonæ Fidei et consona sit Rationi, sicut prædictum est. Hiis Testibus, &c.
"That these Three Petitions are but One, with some few Alterations. "Concerning the Third Charge, about the Riot of Cheapeside. "Concerning the last Charge, of denying to call a Common Council. "That the Common Council in January, called by Command of the King, was held in the Morning; and that which was appointed by the Court of Aldermen was intended to be in the Afternoon. "The House of Commons desires to be disburthened of this Lord Mayor, and that he may be punished." This being ended, they were all commanded to withdraw. Ordered, That this Letter be forthwith printed and published. "That Sir Nic. Slanning is disabled from sitting this Parliament in the House of Commons, and sent for as a Delinquent. "That Sir Bevile Greenvile and Mr. Arrundle are summoned. "That Mr. Hatch, the Minister that preached the Sermon, be sent for as a Delinquent. "That the High Sheriff of the County of Cornwaile is sent for as a Delinquent." Ordered, That this House agrees with the House of Commons, in all these Particulars. Ordered, That this House will take into Consideration what Judgement to give in the Lord Mayor's Cause; and that all the Lords be summoned to be here, in their Robes. Lanceston, the 5th of Aug. 1642. "To our Honourable Friend, Wm. Lenthall, Esquire, Speaker of the Commons House in Parliament. These, present." "Instructions for Guilbert Millington, Esquire, a Member of the House of Commons, Francis Perpoynt, Esquire, Sir Francis Molineux, Baronet, Sir Francis Thornbaugh, Sir Gervas Eyre, Knights, John Hutchinson, Francis Thornhaugh, Gervis Pigott, Henry Sacheverell, Henry Ireton, Joseph Widmerpoole, Robt. Reynes, Charles White, Esquires, John James, Mayor of the Town of Nottingham, and Wm. Drury, Alderman, and for the rest of the Deputy Lieutenants of the County of Nottingham, nominated by both Houses of Parliament, for the Preservation of the said County, and the County of the Town of Nottingham. "Whereas it doth appear to the Lords and Commons now assembled in Parliament, That the King, seduced by wicked Counsels, intends to make War against His Parliament; and for that it is not improbable that, under Colour of raising a Guard for His Majesty's Person, or some other Pretence, the Knights, Gentlemen, Freeholders, and Inhabitants, of the County of Nottingham, and County of the Town of Nottingham, may be drawn together: Therefore you, and every of you, shall take special Care, that the Ordinance touching the Militia be forthwith put in Execution through the County; and the Sheriffs, and all other Officers and Subjects, are hereby enjoined to assist you, and every of you, therein; and, if any Person whatsoever shall levy, or endeavour to levy, any Soldiers, or to draw or keep together the Trained Bands, or other armed Forces of the said County, or any other Forces, by Colour or Pretence of any Commission or Warrant from His Majesty, under the Great Seal, or otherwise, without Order or Consent of both Houses of Parliament, you are to make known to the Trained Bands, and other Inhabitants of the said County, that those who shall appear upon any such Warrant, or obey any such Commission, shall be held Disturbers of the public Peace; and those who shall not appear upon any such Warrant or Commission, nor do any Thing in Execution thereof, shall be protected by both Houses of Parliament. 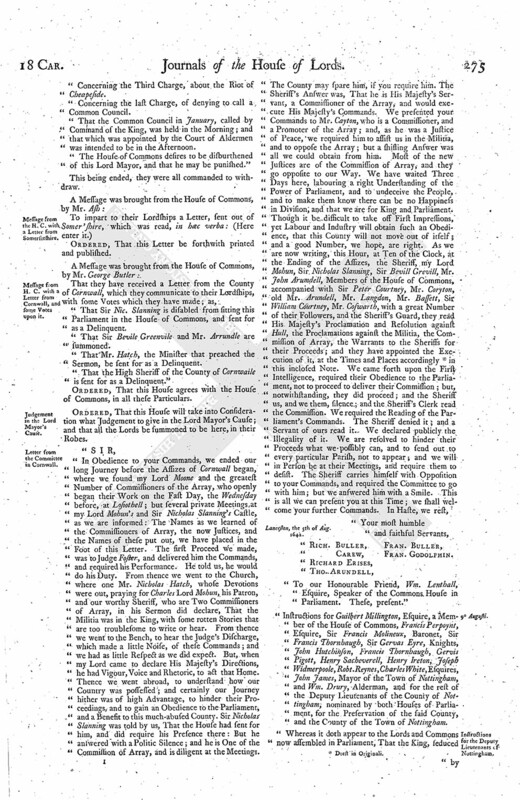 "And you, and every of you, shall, in the Name and by the Authority of both the said Houses, require and command all Persons to forbear the Execution of such Commission or Warrant, and the same to be delivered up to you, or any of you, to be sent to the Speaker of the House of Commons; and you, and every of you, Deputy Lieutenants, are hereby required to draw together such of the Trained Bands, and other Forces of the said County, as shall be expedient, for the suppressing of all such Assemblies, and for the apprehending of all or any Person or Persons as shall, after Admonition and Command by you, or any of you, made unto them, to forbear the Execution of any such Commission or Warrant, or the calling or gathering or keeping together of any such Forces or Assemblies, still persist in doing the same, and likewise such as shall bear Arms by Colour of any Warrant or Commission from His Majesty, under the Great Seal or otherwise, without Order or Consent of both Houses of Parliament, and also such disaffected Persons as shall be found raising any Parties or Factions against the Parliament, to be sent up hither, to answer such their Offences, as to Law and Justice shall appertain. 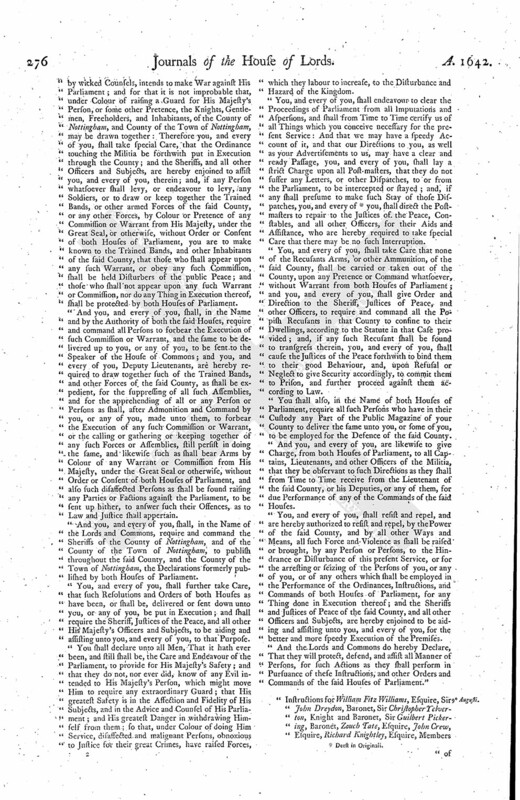 "And you, and every of you, shall, in the Name of the Lords and Commons, require and command the Sheriffs of the County of Nottingham, and of the County of the Town of Nottingham, to publish throughout the said County, and the County of the Town of Nottingham, the Declarations formerly published by both Houses of Parliament. 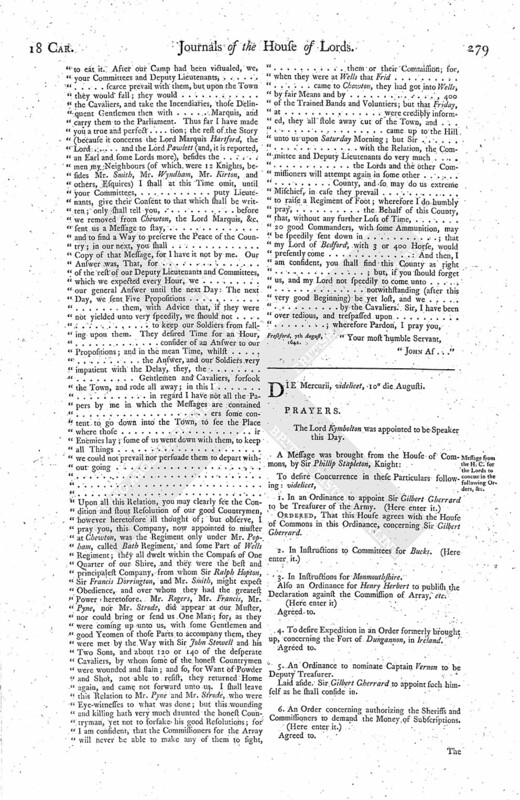 "You, and every of you, shall further take Care, that such Resolutions and Orders of both Houses as have been, or shall be, delivered or sent down unto you, or any of you, be put in Execution; and shall require the Sheriff, Justices of the Peace, and all other His Majesty's Officers and Subjects, to be aiding and assisting unto you, and every of you, to that Purpose. 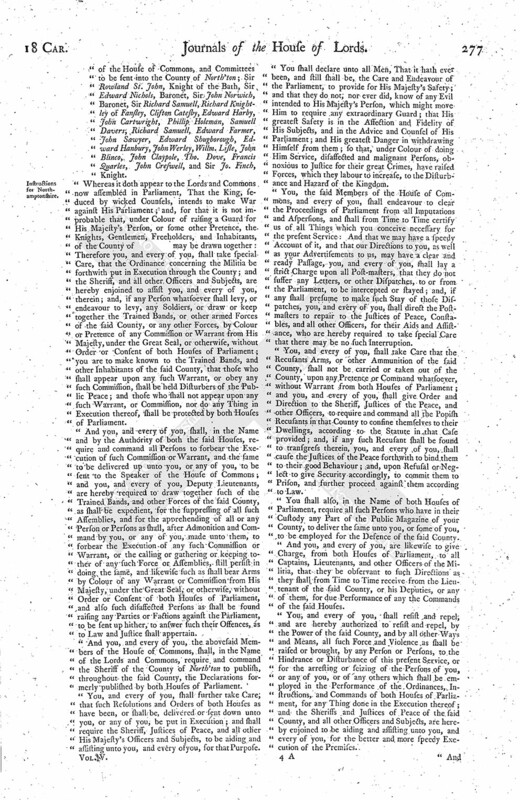 "You shall declare unto all Men, That it hath ever been, and still shall be, the Care and Endeavour of the Parliament, to provide for His Majesty's Safety; and that they do not, nor ever did, know of any Evil intended to His Majesty's Person, which might move Him to require any extraordinary Guard; that His greatest Safety is in the Affection and Fidelity of His Subjects, and in the Advice and Counsel of His Parliament; and His greatest Danger in withdrawing Himself from them; so that, under Colour of doing Him Service, disaffected and malignant Persons, obnoxious to Justice for their great Crimes, have raised Forces, which they labour to increase, to the Disturbance and Hazard of the Kingdom. "You, and every of you, shall endeavour to clear the Proceedings of Parliament from all Imputations and Aspersions, and shall from Time to Time certify us of all Things which you conceive necessary for the present Service: And that we may have a speedy Account of it, and that our Directions to you, as well as your Advertisements to us, may have a clear and ready Passage, you, and every of you, shall lay a strict Charge upon all Post-masters, that they do not suffer any Letters, or other Dispatches, to or from the Parliament, to be intercepted or stayed; and, if any shall presume to make such Stay of those Dispatches, you, and every of (fn. 2) you, shall direct the Postmasters to repair to the Justices of the Peace, Constables, and all other Officers, for their Aids and Assistance, who are hereby required to take special Care that there may be no such Interruption. "You, and every of you, shall take Care that none of the Recusants Arms, or other Ammunition, of the said County, shall be carried or taken out of the County, upon any Pretence or Command whatsoever, without Warrant from both Houses of Parliament; and you, and every of you, shall give Order and Direction to the Sheriff, Justices of Peace, and other Officers, to require and command all the Popish Recusants in that County to confine to their Dwellings, according to the Statute in that Case provided; and, if any such Recusant shall be found to transgress therein, you, and every of you, shall cause the Justices of the Peace forthwith to bind them to their good Behaviour, and, upon Refusal or Neglect to give Security accordingly, to commit them to Prison, and further proceed against them according to Law. "And you, and every of you, are likewise to give Charge, from both Houses of Parliament, to all Captains, Lieutenants, and other Officers of the Militia, that they be observant to such Directions as they shall from Time to Time receive from the Lieutenant of the said County, or his Deputies, or any of them, for due Performance of any of the Commands of the said Houses. "You, and every of you, shall resist and repel, and are hereby authorized to resist and repel, by the Power of the said County, and by all other Ways and Means, all such Force and Violence as shall be raised or brought, by any Person or Persons, to the Hindrance or Disturbance of this present Service, or for the arresting or seizing of the Persons of you, or any of you, or of any others which shall be employed in the Performance of the Ordinances, Instructions, and Commands of both Houses of Parliament, for any Thing done in Execution thereof; and the Sheriffs and Justices of Peace of the said County, and all other Officers and Subjects, are hereby enjoined to be aiding and assisting unto you, and every of you, for the better and more speedy Execution of the Premises.
" And the Lords and Commons do hereby Declare, That they will protect, defend, and assist all Manner of Persons, for such Actions as they shall perform in Pursuance of these Instructions, and other Orders and Commands of the said Houses of Parliament." 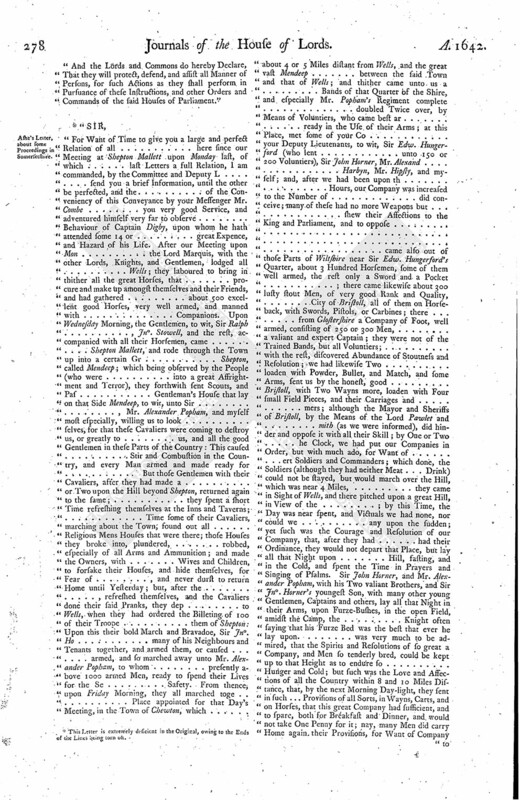 "Instructions for William Fitz Williams, Esquire, Sir John Dreydon, Baronet, Sir Christopher Yelverton, Knight and Baronet, Sir Guilbert Pickering, Baronet, Zouch Tate, Esquire, John Crew, Esquire, Richard Knightley, Esquire, Members of the House of Commons, and Committees to be sent into the County of North'ton; Sir Rowland St. John, Knight of the Bath, Sir Edward Nichols, Baronet, Sir John Norwich, Baronet, Sir Richard Samuell, Richard Knightley of Fansley, Clifton Catesby, Edward Harby, John Cartwright, Phillip Holeman, Samuell Davers, Richard Samuell, Edward Farmer, John Sawyer, Edward Shugborough, Edward Hanbury, John Werley, Willm. Lisle, John Blinco, John Claypole, Tho. Dove, Francis Quarles, John Creswell, and Sir Jo. Finch, Knight. "Whereas it doth appear to the Lords and Commons now assembled in Parliament, That the King, seduced by wicked Counsels, intends to make War against His Parliament; and, for that it is not improbable that, under Colour of raising a Guard for His Majesty's Person, or some other Pretence, the Knights, Gentlemen, Freeholders, and Inhabitants, of the County of may be drawn together: Therefore you, and every of you, shall take special Care, that the Ordinance concerning the Militia be forthwith put in Execution through the County; and the Sheriff, and all other Officers and Subjects, are hereby enjoined to assist you, and every of you, therein; and, if any Person whatsoever shall levy, or endeavour to levy, any Soldiers, or draw or keep together the Trained Bands, or other armed Forces of the said County, or any other Forces, by Colour or Pretence of any Commission or Warrant from His Majesty, under the Great Seal, or otherwise, without Order or Consent of both Houses of Parliament; you are to make known to the Trained Bands, and other Inhabitants of the said County, that those who shall appear upon any such Warrant, or obey any such Commission, shall be held Disturbers of the Public Peace; and those who shall not appear upon any such Warrant, or Commission, nor do any Thing in Execution thereof, shall be protected by both Houses of Parliament. 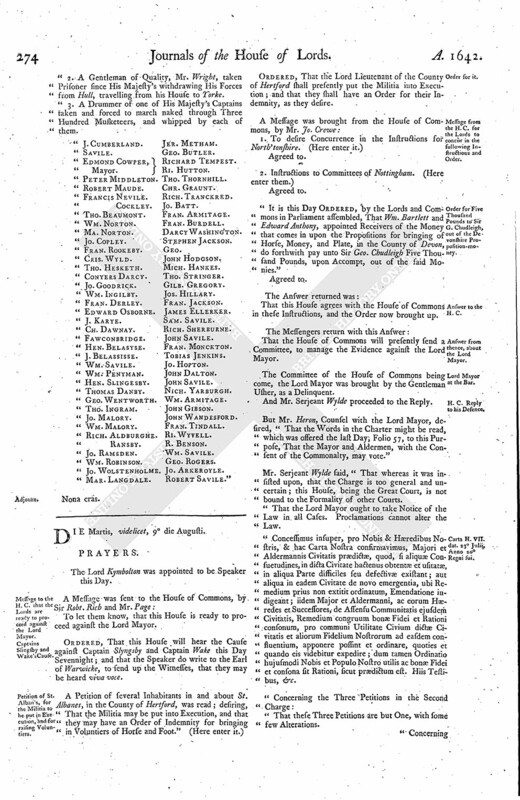 "And you, and every of you, shall, in the Name and by the Authority of both the said Houses, require and command all Persons to forbear the Execution of such Commission or Warrant, and the same to be delivered up unto you, or any of you, to be sent to the Speaker of the House of Commons; and you, and every of you, Deputy Lieutenants, are hereby required to draw together such of the Trained Bands, and other Forces of the said County, as shall be expedient, for the suppressing of all such Assemblies, and for the apprehending of all or any Person or Persons as shall, after Admonition and Command by you, or any of you, made unto them, to forbear the Execution of any such Commission or Warrant, or the calling or gathering or keeping tother of any such Force or Assemblies, still persist in doing the same, and likewise such as shall bear Arms by Colour of any Warrant or Commission from His Majesty, under the Great Seal, or otherwise, without Order or Consent of both Houses of Parliament, and also such disaffected Persons as shall be found raising any Parties or Factions against the Parliament, to be sent up hither, to answer such their Offences, as to Law and Justice shall appertain. "And you, and every of you, the abovesaid Members of the House of Commons, shall, in the Name of the Lords and Commons, require and command the Sheriff of the County of North'ton to publish, throughout the said County, the Declarations formerly published by both Houses of Parliament. "You, and every of you, shall further take Care, that such Resolutions and Orders of both Houses as have been, or shall be, delivered or sent down unto you, or any of you, be put in Execution; and shall require the Sheriff, Justices of Peace, and all other His Majesty's Officers and Subjects, to be aiding and assisting unto you, and every ofyou, for that Purpose. "You, the said Members of the House of Commons, and every of you, shall endeavour to clear the Proceedings of Parliament from all Imputations and Aspersions, and shall from Time to Time certify us of all Things which you conceive necessary for the present Service: And that we may have a speedy Account of it, and that our Directions to you, as well as your Advertisements to us, may have a clear and ready Passage, you, and every of you, shall lay a strict Charge upon all Post-masters, that they do not suffer any Letters, or other Dispatches, to or from the Parliament, to be intercepted or stayed; and, if any shall presume to make such Stay of those Dispatches, you, and every of you, shall direct the Postmasters to repair to the Justices of Peace, Constables, and all other Officers, for their Aids and Assistance, who are hereby required to take special Care that there may be no such Interruption. "You, and every of you, shall take Care that the Recusants Arms, or other Ammunition of the said County, shall not be carried or taken out of the County, upon any Pretence or Command whatsoever, without Warrant from both Houses of Parliament; and you, and every of you, shall give Order and Direction to the Sheriff, Justices of the Peace, and other Officers, to require and command all the Popish Recusants in that County to confine themselves to their Dwellings, according to the Statute in that Case provided; and, if any such Recusant shall be found to transgress therein, you, and every of you, shall cause the Justices of the Peace forthwith to bind them to their good Behaviour; and, upon Refusal or Neglect to give Security accordingly, to commit them to Prison, and further proceed against them according to Law. "And you, and every of you, are likewise to give Charge, from both Houses of Parliament, to all Captains, Lieutenants, and other Officers of the Militia, that they be observant to such Directions as they shall from Time to Time receive from the Lieutenant of the said County, or his Deputies, or any of them, for due Performance of any the Commands of the said Houses. "You, and every of you, shall resist and repel, and are hereby authorized to resist and repel, by the Power of the said County, and by all other Ways and Means, all such Force and Violence as shall be raised or brought, by any Person or Persons, to the Hindrance or Disturbance of this present Service, or for the arresting or seizing of the Persons of you, or any of you, or of any others which shall be employed in the Performance of the Ordinances, Instructions, and Commands of both Houses of Parliament, for any Thing done in the Execution thereof; and the Sheriffs and Justices of Peace of the said County, and all other Officers and Subjects, are hereby enjoined to be aiding and assisting unto you, and every of you, for the better and more speedy Execution of the Premises. "And the Lords and Commons do hereby Declare, That they will protect, defend, and assist all Manner of Persons, for such Actions as they shall perform in Pursuance of these Instructions, and other Orders and Commands of the said Houses of Parliament." "John As . . ."
3. This Letter is extremely deficient in the Original, owing to the Ends of the Lines being torn on.